It seems that no amount of publicized social media faux pauxs let alone general marketing faux pauxs over the past hundred years are able to prevent other brands from becoming bumbling idiots ripe for ridicule. Today's marketing dunce cap goes to Health provider HealthNet which saw fit to use a fake tweet on a billboard (spotted in Portland, Oregon) to promote its site. 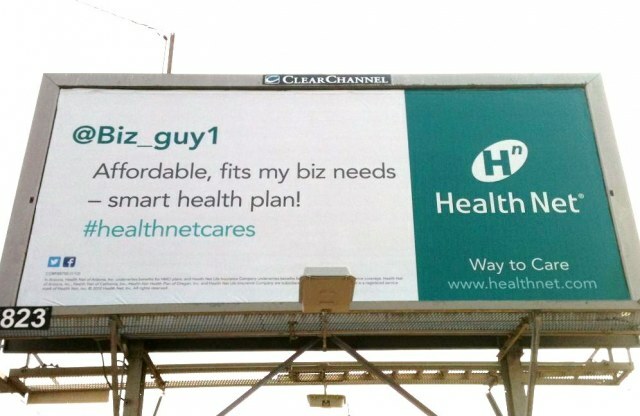 The tweet, "Affordable, fits my biz needs - smart health plan #healthnetcares," reads as if it were written some social media buffoon with just enough pompous "guruism" to convince his clueless superiors "this will be a really cool billboard!" The account from which this tweet emanated is a protected account with zero tweets, zero followers and a zero follower account. Whether or not HealthNet created this account or simply chose a dead account is unclear at this point. Either way, it's a juvenile marketing move and yet another example of testimonials gone wrong. Are there really people this stupid working in marketing?